Hi everyone! I am excited to host my first giveaway! 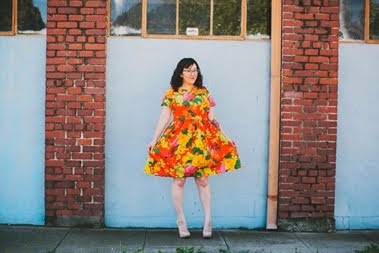 My friend Krista makes all of the products on the Augie and Lola Baby Boutique Etsy store and has been nice enough to give away an item to one of you reading this. How cute is this bib??? 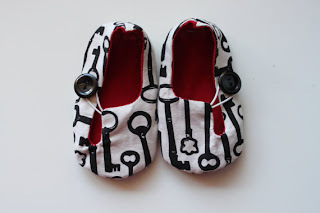 I don't have kids, but these shoes would make a great gift for one of my friends that does. Here's how it works: go to Krista's Etsy store and pick your favorite item. You can choose between a bib (she will make a matching burp cloth to go along with it) or a pair of shoes. If you would prefer a different fabric she will even customize the fabric to your liking! Leave a comment here with your e-mail address and the item you would like to win. That's it! The giveaway is open to participants worldwide, will run through the week, and end on Saturday, January 21st at 6:00 PM (PST). P.S. You might want to follow her on Facebook too. She posts coupons and other cool things! I love these shoes! would be perfect for my coming baby girl! As a Grammy I love everything and most likely will go broke buying them up! Love her style and work ! I would love to win the Skeleton Keys Bib!!!! Love all of Krista's stuff though! I would love to win the skeleton shoes! So cute! Every thing is sooo cute! I think my favorite is the Mary Jane shoes with hot pink tie. I would love to win a pair of those! I would love to win the brown bird house Mary janes...so cute!! 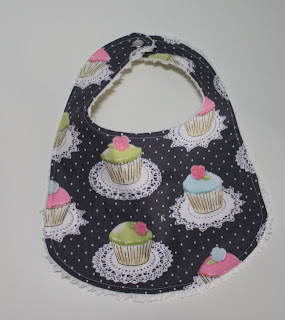 I love the cupcake bib shown above! I have a friend who is having their first child and doing everything in owls...I know they would love a bib and matching burp...all so cute!